From Facebook, May 17, 2015: I was talking to a smartypants friend earlier this week, and we were chatting about MJ. I had mentioned to her that several folks have asked if we’d be setting up a GoFundMe for MJ. I told her that we felt weird about it; we have pets, we’re responsible for whatever happens, etc. She made a very good point: it’s all about how you define need. And I’ve been thinking about it. We need to do this. We won’t forgive ourselves if we don’t try. We’ll refinance or blow credit card limits or whatever it takes. But if there’s help… yeah. We’re not too proud to accept it. Hello! My name is MJ, which stands for Most Joyful or Ms Jackson (depending on my mood). 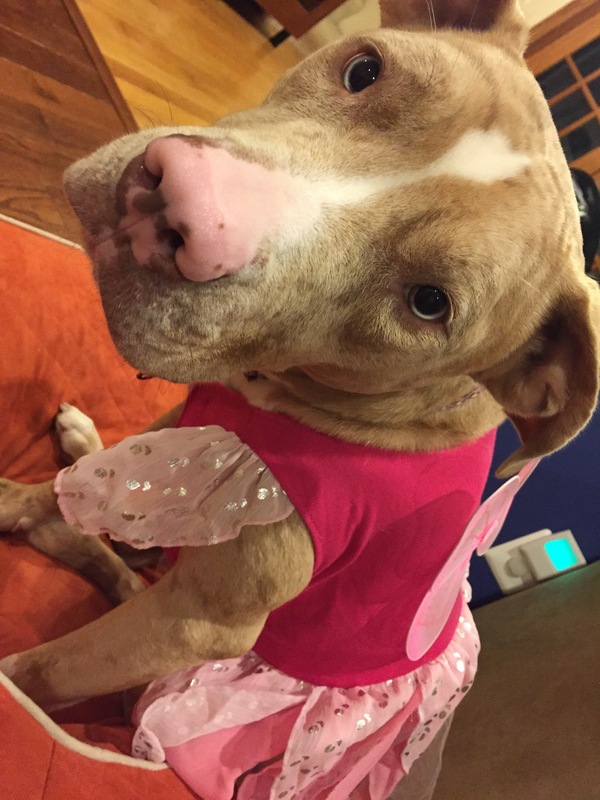 I am a 4 year old Pit Bull/Catahoula Leopard Hound mix. I have lived with my mommy and daddy and furbrother since they rescued me when I was 8 weeks old. I’m a very good girl and an ambassador for my breed. I love people and I’m excellent at chasing squirrels and giving kisses and snuggling. In early April, I was diagnosed with a glioma, an aggressive and recurring brain tumor. 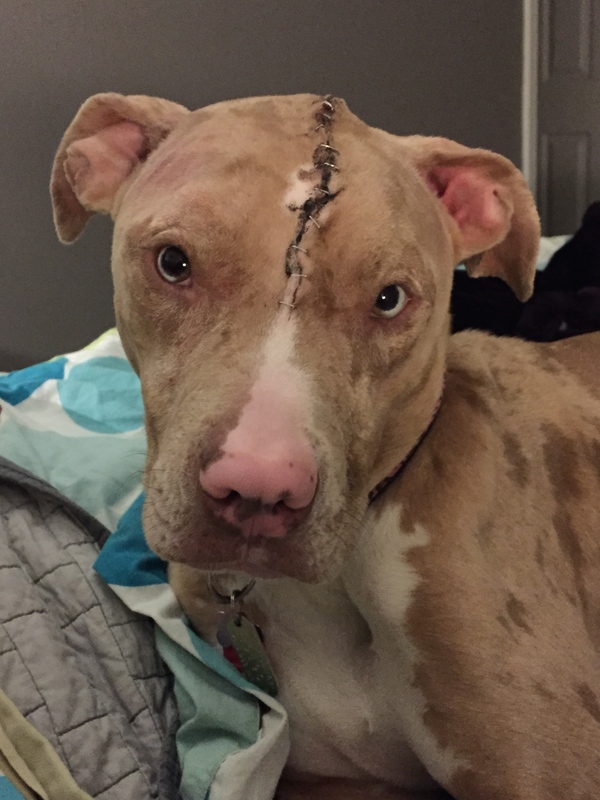 My mommy and daddy had the tumor removed, and we’re working on getting my stitches out. I have seizures because of the tumor, but my doctors are helping me control them with medicine. My tumor will come back, but with radiation therapy and chemotherapy I should have lots more time to run and wrestle and love and snore. My doctors say I am an excellent candidate for treatment. Mommy and daddy weren’t sure about making this page, but they want me to have the best chance possible at a longer life. My vet bills are very expensive, but mommy and daddy don’t want to be greedy. They’re doing the best that they can. If you decide to help us, we’ll send you frequent updates about my prognosis and adventures. Really, how can you say no to this face? May 20, 2015: Thank you so much for your generosity. We’re completely overwhelmed by your support. This morning, MJ started her newest adventure: radiation therapy. She’s got her war-paint on and she’s ready to go! James dropped her off at the crack of dawn to be prepped for the first of her 16 treatments. We’re planning a quiet, snuggle-filled night. We’ll keep you posted on her progress and, most importantly, when she FINALLY has her sutures removed. May 26, 2015: Thank you for your continued support and well-wishes. MJ completed her first week of radiation therapy on Friday. She seems to have responded well to the treatment, and she’s adjusting to her new meds. Over the weekend, we spent a lot of time snuggling with her on the couch and, as long as she was calm, we kept her e-collar off. Big privileges for such a small girl. She seemed much more comfortable without it on (no surprise there), and was her goofy self. As soon as the stitches come out, she’ll be a much happier girl. June 1, 2015: Week three begins! This week, MJ will have five treatments (it’s a full, non-holiday week). This will be her longest stretch, but she’s been such a trooper she’ll have no troubles. 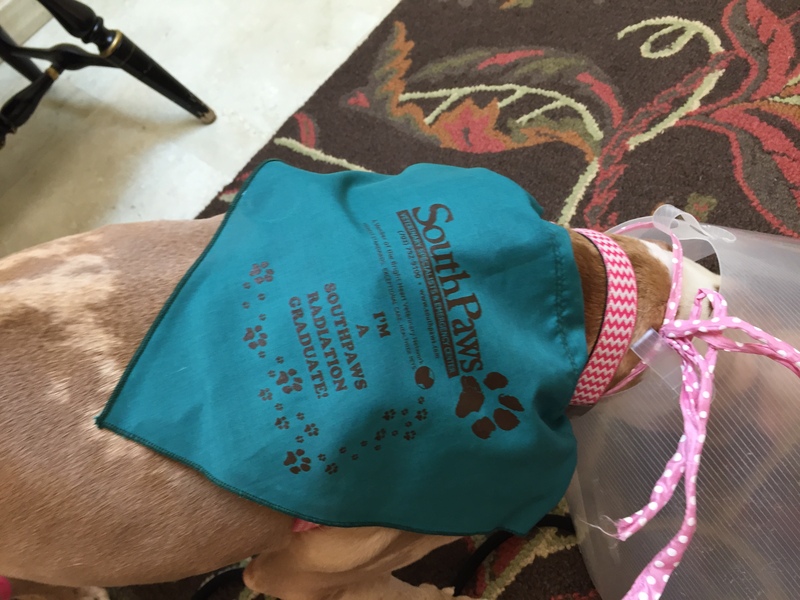 At the end of last week, there was some swelling along her incision and the wound started to weep. While under anesthetic, the doctors opened her up to see what was happening, took a culture, and stitched her back together. Five new sutures means we’re still in a cone-of-shame. For those of you keeping score at home, we’re entering Week 8. The cone’s not slowing her down, though. She’s figured out how to navigate up and down the stairs at full speed, push open doors, and knock her brother out of the way for treats. We’ve turned on the air conditioning and she has taken to flopping in front of the vents, cone positioned to scoop all of the cool air to her head. We cannot thank you enough for your generosity and support. Those who opted in to a personal Thank You note from MJ– it’s on the way! June 8, 2015: Today, MJ begins her final four days of radiation treatments! It seems like time has flown and dragged at the same time. We’re still struggling to keep her weight up, but she appears to have stabilized right around 51 lbs. That’s low for her, but better than where she was when we started treatments. The trick will be to keep her weight up once she’s permitted to be more active. Her incision appears to be sealing up and we’re hopeful (as always) that we’ll have a cone-free pup at the end of the week. We’ll treat her to a spa bath to get rid of the medicinal smells and war paint. Next week, we’re expecting to begin her chemo treatments. Dogs respond to chemotherapy differently than humans: the meds are just another pill she’ll take at regular intervals during the remainder of the summer without significant side effects (nausea, hair loss, behavioral changes). Thank you for your continued support, emails and texts inquiring after our pups. We appreciate it more than we can express. June 11, 2015- And… we’re done! Today, MJ completed her radiation therapy. In two weeks, she’ll kick off her chemo. She’s got some survivor swag now, too! June 23, 2015– Keep your fingers crossed! MJ has a suture-removal scheduled for tomorrow morning. If she leaves the appointment stitches-free, we’ll be able to schedule her first chemo treatment. The adventure continues. Since MJ’s final radiation session almost two weeks ago, we’re settling back into our “normal” routine at home. She’s completely over being in a cone, and it’s beginning to frustrate her that she’s still restrained on-harness when we’re outside. She just wants to run and play. I don’t blame her. Her appetite is good and she’s looking less rib-y. She’s incredibly thirsty because of her steroids, but she’s good on her feet and seizure-free. August 8, 2015: This is posting a bit late in the game (apologies!). Big news: this Wednesday, MJ reached a new milestone. We are officially three sessions into her chemotherapy– exactly half way. If you want to take that further, she is 75% done with her cancer treatments. And her weight is up to 54.8 lbs, exactly where she began her journey in April. In response to her treatments, MJ has developed a very faint heart murmur and her liver enzymes are a little low. We’re keeping an eye (ear) on her heart and she’s starting a liver supplement. These side effects were unexpected but not abnormal. Thank you so much for your continued support and messages of love. From November 26, 2015: Sitting around the table today, it’s easy to reminisce about what you’re thankful for: friends, family, health, a safe place to call home… Today, we’re thankful for all of those things, especially because of your generosity this year. Every time we look at stinky, marvelous girl, we are instantly grateful that you supported our family in our time of need. -MJ’s final chemo session was scheduled for October 9th. Due to increasing concerns about her elevated liver enzyme count, her oncologist decided to discontinue treatment. -A month later, we returned to the oncologist for a check up. MJ’s liver levels had returned to normal and her blood work showed no evidence of disease. No additional chemo will be administered; we’re just going to watch and wait. -On November 11, MJ attended day camp for the first time since her diagnosis. She did well and ran herself out. We go back for a check up in January. Until then, we’re back to business as (un)usual. Have a safe and warm holiday. We hope it’s full of snuggles and pie. December 17, 2015: We’re taking this page (GoFundMe) offline today. All of the updates are saved to PBnCheese. We can’t thank you enough for your generosity and support.